Please join us on Tuesday December 7, 2010 for the next Ottawa Sybase User Group (OSUG) special event! OSUG's mission is to create a Sybase community in the National Capital area of Canada where users can share knowledge, experiences, and best practices. Users of all Sybase products, including data management, tools and mobility are welcome to attend. This meeting will feature networking opportunities, product updates and a discussion. The OSUG Dec 7, 2010 meeting will be held in Ottawa at Constitution Square in the double Board Room (down the hallway from the Queen's University MBA lecture theater). Constitution Square is located at 350 Albert Street (at Lyon) just across the street from the Crowne Plaza hotel. Bus access is right to the door and parking is available at the hotel, in Constitution Square and across the street. The Double Board room is located on the second floor (center) and can be accessed from either the west or east elevators. If you are coming from outside the National Capital region - Ottawa’s Christmas Lights Across Canada event runs for five weeks from Dec. 2 to Jan. 7, with more than 300,000 lights adding sparkle to the Capital Region. The best concentration of lights is along “Confederation Boulevard”, the name given to the circle of roads that connect the city’s most important buildings including Parliament Hill, the Supreme Court, the Canadian Museum of Civilization, the National Gallery. PowerBuilder 12.1 framework for EAServer! Software Tool & Die Inc is pleased to announce that they have released a new version of their STD Foundation Classes for the production version of PowerBuilder 12.1 classic and the EAServer application server version 5.5 through 6.3. This release is based on the STD framework using PowerBuilder 12.1.0 build 6518. PowerBuilder developers can now enjoy this superior framework for their mission critical applications allowing them to communicate to NVUO's from either JSP or ASP.Net based web application environments. The framework architecture is MVC compliant and allows superior performance, stability, features, etc for EAS based PB component business logic! The STD Foundation Classes are a free business and productivity framework and available for Appeon, InfoMaker, EAServer, PocketBuilder, and PowerBuilder that support .Net Assemblies, WebForm, WinForn, Win32, WPF and JSP/ASP deployment as well. Note: For those developers who have an ISUG membership at either the Gold or Green level - you can download the full development version of PowerBuilder 12.1 for free to use at home for learning purposes. 2) Minor code changes for better performance. Along with the new framework for EAServer, there is also an updated example sStore ASP.Net application that uses PB 12.1 NVUO's built with the STD Foundation Classes to aid in the learning and testing experience. Both the updated EAServer based STD framework and the eStore sample application have been uploaded to the SourceForge website (click here). Select "View All Files" at the main project page and the look for the EAServer folder. The International Sybase User Group in conjunction with eLearnIt Systems is now offering a new one day PowerBuilder 12.NET training course. In this a full day of training where you will gain the knowledge and skills to prepare you to plan, perform a .NET migration and tips on re-factoring your enterprise level based PowerBuilder Classic applications. You will able to follow-along with instructor led demonstrations using provided code examples if you bring your own notebook with verified functioning installations of PowerBuilder 12.1 Classic and .NET and SQL AnyWhere 11. * What are the important features and how do they affect your PowerBuilder application? * Why might .NET be (or not be) important to you? Future proofing your code, planning for today, tomorrow and beyond. The new .NET IDE is similar to but different than the Classic IDE in fundamental ways. The goal of this presentation. Increase your initial and ongoing productivity by learning how to leverage many of the new features that the Visual Studio IDE offers. Included is a demonstration of configuring and working with source code control. Windows Communication Foundation is a new feature of .NET 3.5. WCF will be an imperative when SilverLight support is implemented. It is required when you migrate Classic Applications that are Web Service Clients to .NET or need to code new web service client applications in PB 12.NET. Learn the basics of WCF. Observe the process of building a Web Service Client app. To have this course brought to your area, please contact your local Sybase User Group to arrange a class in your locale. Appeon 6.5, the most powerful and flexible version of the go-to web deployment tool to date. Appeon 6.5 introduces support for the JBoss Platform; take advantage of the popular open-source platform and Appeon brings you these new features while preserving stability and performance! Support for the latest Software: PowerBuilder 12 Classic, Windows 7, EAServer 6.3, and Sybase's SQL Anywhere 12 DBMS. Try Appeon 6.5 for PowerBuilder free now from Appeon corporation itself or one of its distributors: Sybase or Novalys. For those individuals who have an ISUG membership, you can get a full (unrestricted) developer version for free with your Gold or Green membership! PS: Check out my free Foundation Classes for PB and Appeon! For the first time in our history, the Ottawa Sybase User Group (OSUG) held a two day event hosting many Sybase professionals, 3rd party vendors, user presentations, senior management participation, etc culminating in an event I would like to call the "Canadian Technical Summit". This event had two streams - one Data Management and the other Development. There was even a "cocktail reception" on the Tuesday night! The event covered subject areas such as: SMS messaging from PB 12.NET, Taking your PowerBuilder applications to the Web; Data Warehousing, Replication, Sybase and SAS, Data Modeling, Database Monitoring and Performance, ASE and PB tools, Product Futures, Mobility, etc just to highlight some key areas. On the Development side we saw evangelist John Strano showing us the latest PB 12.NET from engineering, best practices and another training session. For Data Management we had senior Sybase VP Brian Vink addressing key product futures, Mobility and presentations on comparing various Data Modeling approaches. We also had access to key Sybase technical staff from Canada and the USA to ask questions about Sybase products, interact with users utilizing the same technologies and gain key information into 2010 based products and features. If you encounter any problems with the downloads or have suggestions for future meetings - please drop me a note. Enjoy and thanks again for coming ... Chris! Software Tool & Die Inc is pleased to announce that they have released a new version of their STD Foundation Classes for the production version of Appeon 6.2. This release is based on the STD framework using PowerBuilder11.5.1 build 4011. PowerBuilder developers can now enjoy this superior framework for their mission critical applications allowing them to deploy either JSP or ASP.Net based web server environments. In the mean time, Appeon will supercharge your Web deployed applications assisted by the STD FC's lightweight performance architecture! The STD Foundation Classes are a free business and productivity framework for now Appeon, InfoMaker, EAServer, PocketBuilder, and PowerBuilder that support .Net Assemblies, WebForm, WinForn, Win32, WPF and now JSP/ASP deployment as well. For those developers who have an ISUG membership at either the Gold or Green level - you can download the full development version of Appeon 6.2 for free as well. Along with the new framework for Appeon 6.2, there is also new example OrderEntry application that uses the Appeon aligned STD Foundation Classes to aid in the learning and testing experience. Both the new Appeon based STD framework and the OrderEntry sample application have been uploaded to the SourceForge website (click here). Select "View All Files" at the main project page and the look for the new Appeon folder. Washington, D.C., August 9, 2010 – The International Sybase User Group, a trade association representing more than six thousand members in more than sixty countries around the globe, announced today at the Sybase TechWave user conference that ISUG Green and Gold Members are now eligible to receive a one-year, fully functional trial version of PowerBuilder 12 as part of their member benefits. Central to ISUG's membership services remit is the responsibility to use the organization's proximity to and close relationship with Sybase itself to provide tangible user benefits that far outweigh the cost of the group's membership subscription charge. In return, ISUG stands open to receive member feedback on the products and services that users themselves feel they need additional support with. Be in terms of training, guidance from Sybase evangelists, user group meetings or access to actual products, ISUG constantly strives to exceed its members expectations. "Our members have been waiting patiently for this new benefit and we're extremely pleased to be able to offer it to them with immediate effect," commented ISUG President, Bryan Enochs. "This new benefit allows our members to experiment with PowerBuilder 12 at their own pace, something that is extremely important as it enables full exploration of all of the features and functionality that this eagerly awaited release contains." "We are seeing more and more PowerBuilder developers attending our user group meetings," said Mike Harrold, Executive Director for ISUG. "This confirms to us that PowerBuilder is not only still widely accepted within the IT world, but that it is also a growing developer marketplace. We hope that this shows continued commitment to the Sybase user community from both ISUG and Sybase." New sessions will soon be starting for the Goulbourn TaeKwonDo club run through the City of Ottawa’s recreation department. Once again Master Stephen Yeoh will be heading the program that meets Mondays and Thursdays at the Goulbourn Middle School. This year Master Yeoh is also excited to announce he will be starting a new Friday session with classes located at the Goulbourn Recreation Center in Stittsville. Both locations are family oriented and the curriculum is orchestrated towards children, teens and adults. 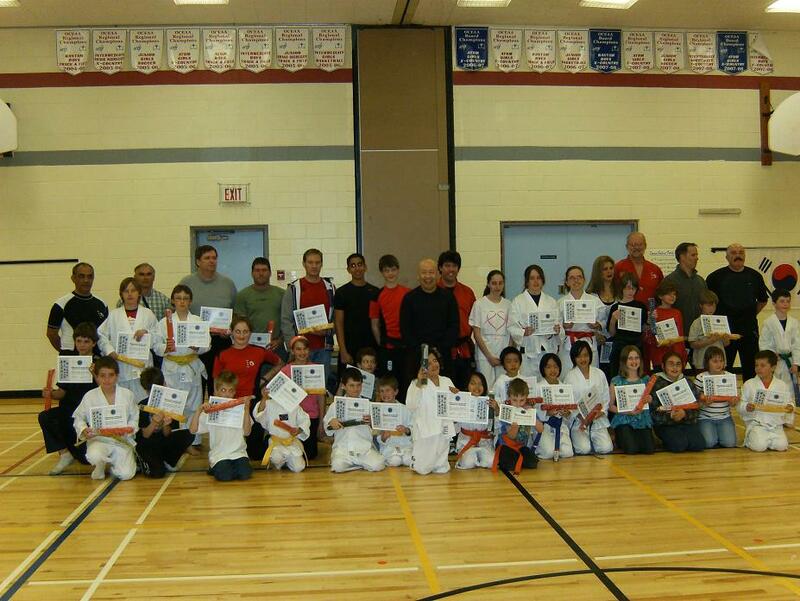 The fall TaeKwonDo winter session gets underway soon and new registrants are most welcome. In the last spring session, the Goulbourn TKD club saw 72 registrations with 32 of these students testing for their next belt level. Over the past 25 years that Master Yeoh has been leading the TKD club and has witnessed just over 200 students attain their black belt level. Master Yeoh along with lead instructor Derek O’Connell have been busy over the summer planning new facets to the curriculum that will please both new and returning martial artists. The new fall program will kick off the 2010/2011 season that will focus on health, fitness and enjoyment along with traditional TaeKwonDo martial arts. The Goulbourn Middle School program will be one hour in length as in previous years. The new Goulbourn Recreation Center program on Fridays will be 1.5 hours long with 1 hour devoted to traditional TaeKwonDo and the next half hour allowing the student to choose from kick boxing, weapons, sparring, or poomsae. Due to the extended length of the Friday program the fee for September to December will be $132 while the Monday and Thursday 1 hour evening program will be $96. Registration for the fall session is now open and can be done online at the City of Ottawa website. Registration can also be done at any city of Ottawa recreation office including the Goulbourn Recreation Complex in Stittsville. As this program is a fully registered sports program - tax receipts will be issued and can be used for tax deductions of up to $500 per year, per child on your 2010 tax return. For more information about the Goulbourn TaeKwonDo program, please see Master Stephen Yeoh’s TKD Website or contact associate instructor Chris Pollach (see TKD website under contacts). The new Appeon version 6.5 for PowerBuilder has just been released that supports PowerBuilder 12 Classic, JBoss application server, .NET server load balancing, and many other new features and enhancements. The edition for .NET platform was just released in August and the edition for Java platform will be available later this month. Web Services can be used as the data source for DataWindows. DataWindows can be saved in various formats, including PDFs and images (JPEG/GIF/BMP). BYTE data type is supported and binary data can be processed as parameters. FileReadEx and FileWriteEx functions are supported for handling large files. Printer page size/width/length can be customized by defining the dimensions in the PB painter. For a complete list of features and product specifications - please see the Appeon webite! Brad Wery has added another great tool to his GUI arsenal of PowerBuilder gadgets. In this case its the new PowerFilter tool that greatly enhances the DataWindow object to enable the application user to specify complex data filtering operations using point-and-click technology. PowerFilter is a powerful, easy-to-implement DataWindow filtering component that provides users functionality similar to what is found in Excel 2007. To learn more about this "kool" PowerBuilder add-on, please visit Brad's PowerToTheBuilder website! The Systems Analyst is an integral part of the RADARSAT-1 satellite team providing service to the operational team. The Systems Analyst interfaces directly with the Mission Planning staff – both government (customer) and contractual. The Systems Analyst is responsible for: the design, development, test, and integration tools; documentation of work to support configuration control board reviews; database administration to maintain the integrity of the operational and development databases; address issues related to system administration, system security, and network configuration; and analyze system performance issues and propose solutions. What is the average size of a PowerBuilder project? What type of application is currently developed with PB? Which other tools are used along with PB? What are the expectations of PowerBuilder users? What trends do you see from your perspective? What are the key PB enhancements IT people are looking for? To what extent will PB be used for Web development? You can provide "valuable" research information and feedback to Sybase and the PowerBuilder community by taking the 2010 survey (click here). If you are interested in last years results for 2009 click here - for results for 2008 click here!